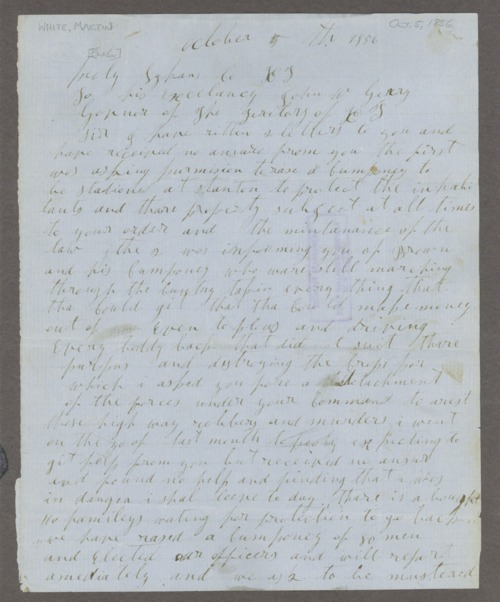 Correspondence relating to Kansas territorial troubles. Topics include interference with law enforcement and the movement of prisoners, reports of raids, and letters from militia leaders. Many of the documents are petitions from communities, including Leavenworth, Sugar Mound (now Mound City), Fort Scott, Westport, Council Grove, Pottawattamie, and Lawrence, seeking relief from robberies and harassment, and the protection of militia escorts. Petitions came from pro-slavery individuals as well, as evidenced by the September 23, 1856 letter written on behalf of citizens of Anderson and Coffey Counties being driven out by abolitionists. The antagonists in these letters include Colonel Whipple (also known as Aaron Dwight Stevens), Captain Frederick Emory, and Sterling Price. A proclamation by Governor Woodson, dated July 4, 1856, forbids the assembly of the "bogus legislature" in Topeka. Another proclamation, dated August 24, 1856, declares the territory to be in a state of open insurrection and rebellion. Other important events, such as the Pottawatomie Massacre and the Battle of Hickory Point, are also mentioned.